Your guest room TV is an important digital touch point with your guests. 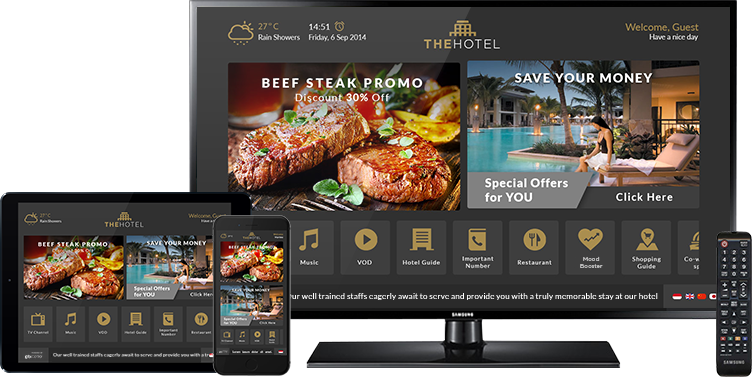 Through our centralised IPTV Management System, you can conveniently design and edit targeted guest communications. The guest experience can also be tailored to suit your hotel’s profile with your logo, visual elements and graphics. Your TVs become a strong way to promote your services and your brand. Improve your hotel’s rating with IPTV.center system. Immerse your guests in an unforgettable experience full of entertainment, and offer news, information and services that your hotel guest needs. Ready to deliver the best guest experience and make them become a life time customer? IPTV Center's interactive TV solution provides all the entertainment options you would expect from a modern TV system, from free or paid live channels to video on demand, music streams and infotainment. 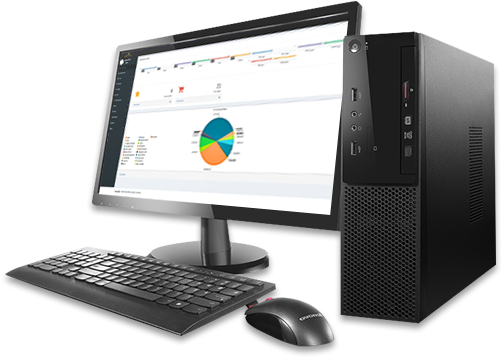 It is easy to deploy in all network environments (wired or wireless) and with a large variety of devices, be it connected TVs or set top boxes. 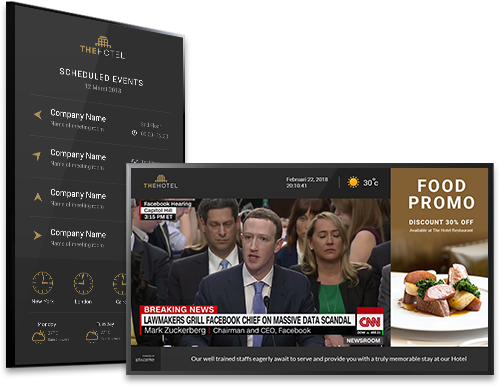 Your hotels get powerful tools to manage staff and communicate with guests. 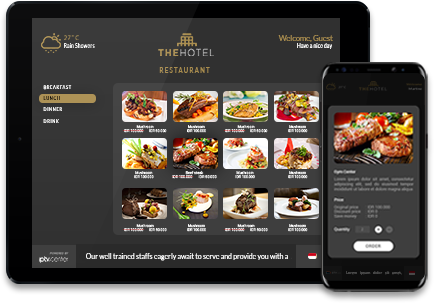 WIth guest’s mobile phone, they will always have the latest usefull information, news, weather, flights, discount, special offer, billing and push notifications, make them have a new and memorable experience in your hotel. 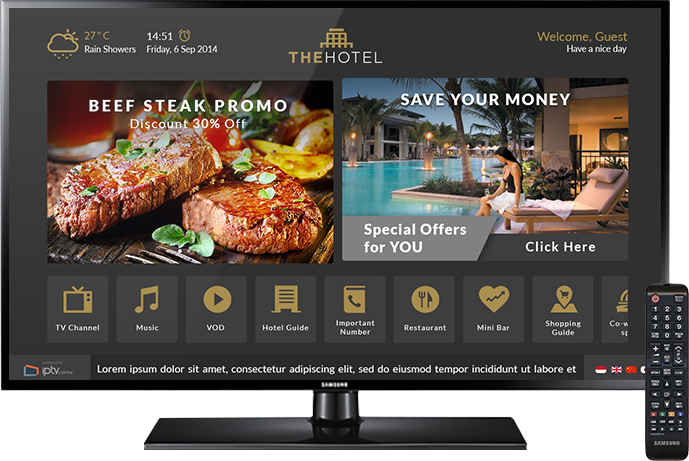 Digital Signage as an Info Channel, will easily make information and offers known to guests using TV screens in public spaces and it will lets you increase your hotel’s additional sales by informing your guests about opening hours at the restaurant and spa, your restaurant menu, room service and weekend offers. You can remotely update your content online and also show unique content in each TV based on its location. 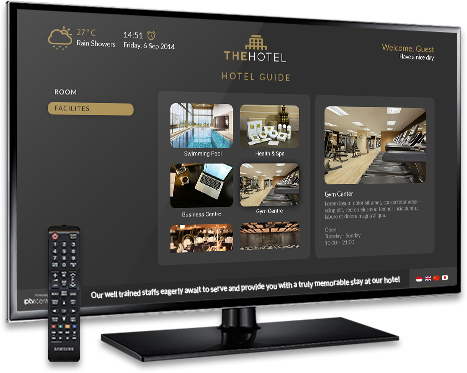 You can remotely monitor and manage the TV infrastructure per hotel, including the network and all connected TV sets in your guest rooms. It allows to define which features to be offered in the menu. change the design or hotel services offering. There is no knowledge of programming required to operate the system. It is simple which allows any changes to be published instantly and up-to-date information to be provided to hotel guests. We offer a comprehensive after-sales service, Flexible Financing for all of our products. 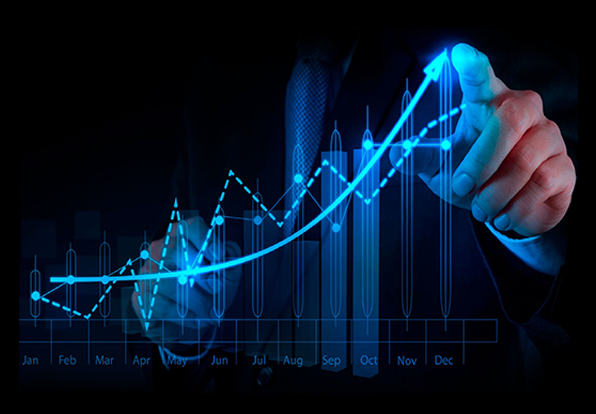 Our dedicated team takes care of everything from network design, installation and security. We will help you deliver an integrated service, for your peace of mind. 2018 © IPTV hotel. All Rights Reserved.